Practical advice, invaluable information, and collected wisdom for folks and farmers in the country, city, and anywhere in between. Includes how to cultivate a garden, buy land, bake bread, raise farm animals, make sausage, can peaches, milk a goat, grow herbs, churn butter, build a chicken coop, catch a pig, cook on a wood stove, and much, much more. This is a great book to snuggle up with on long winter evenings. Carla's stories resonate with the wisdom of someone who has lived what they write. While she was alive, she updated and added on to the book as her life changed. There are heartwarming personal stories interlaced with tons of practical information. When she realized that time spent promoting the book kept her from living the lifestyle she was promoting, she stepped back from the limelight. There are over 2000 recipes, from herbal sachets to raspberry shrub to canning just about anything. You could try a recipe per day and be at it for years. The Food Preservation section has a lot of great recipes – that's where I got my favorite spaghetti sauce recipe for canning. There are also old fashioned techniques such as preserving with vinegar, salt and fat. The animal sections give a broad overview of what's required for critter raising, as well as what to do with the critters when it's time for harvest, whether it be eggs, milk, meat, fat, hide or anything else you could think of using. Don't try to read The Encyclopedia of Country Living in one sitting! It's not that kind of book. At close to a thousand pages, there's a ton of information. Better to snuggle up with a section and peruse at leisure, or simply look up the specific information you need. Are there better books for specific topics? Yes, but this is the most comprehensive homesteading book I've seen that gives enough details to be useful. I really like this book. It's like taking a peek into Carla's life as her homesteading skills evolved. She makes you feel like you're talking to an old friend. I remember being saddened when I heard she passed away back in 2005. She will be greatly missed, but she left one heck of a legacy. Carla Emery lived on a farm in Idaho for more than thirty years as a wife, mother of seven, home-schooler, goat-keeper, garden-grower, writer, and country-living instructor. She wrote and self-published the first editions of The Encyclopedia of Country Living during the early 1970s and also ran her “School of Country Living.” Carla sold nearly 90,000 copies of her self-published editions, traveling the country to promote it and appearing on such shows as The Mike Douglas Show, The Tonight Show with Johnny Carson, The Phil Donahue Show, and Good Morning America, where she demonstrated country-living skills such as goat-milking, bread-making, and butter-churning. When Sasquatch Books published the 9th Edition of Encyclopedia in 1994, Carla continued to travel the country promoting and selling the book, and teaching the timeless skills of country living. Carla cultivated a large and loyal following across the country. Carla passed away in 2005. 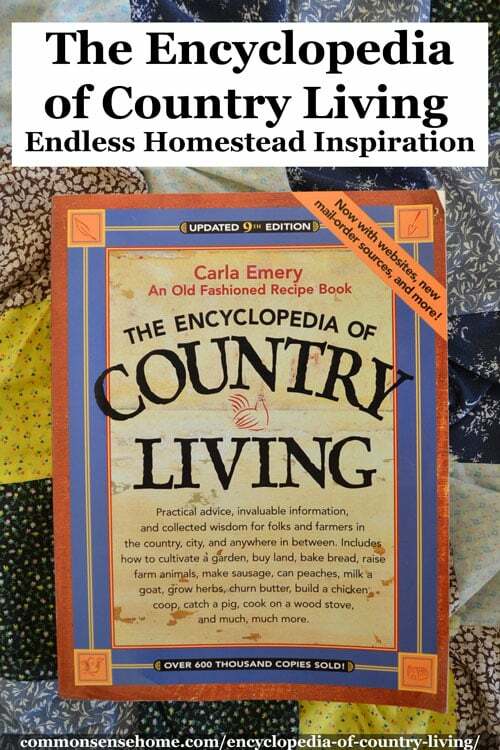 See the Homestead Library for a wide range of book reviews, and “Homesteading – What the Modern Homesteader Needs to Know” and “How to Homestead (Not Quite Like Grandma Used to Do)” for more homesteading ideas. Heather – it really depends upon the topic and your level of knowledge. Everything I’ve tried has been pretty straightforward easy to understand, but I haven’t delved into the animal parts too much. I think the majority of people would find it helpful and easy to use. I tend to consult several sources when I’ve got a really big project, but I think this would get you through almost anything on it’s own. Her daughter has two youtube channels. Everyone should take a look. I agree. I have had mine for more than a decade and I refer to it often. Have a great week. We have this book too. Our local farm supply store carries a selection of books, must be a vendor pack because they often change. This was one of them and it covers just about everything! I have a ragged, tattered copy of this book that I bought from Carla a few years before she died, back when she was doing the “circuit”. While it can’t possibly go into all of the details on everything, it sure does a good job of covering a huge variety of topics. I wouldn’t part with mine for the world! Yes, this is my all time favourite homesteading book. I was so sad a few years ago to hear that Carla had passed away. Elsie Hoover. So much info on everything you can think of: canning, freezing, preserving, breads, soups, salads, meats and TVP, old pioneer recipes, and stand-bys, etc.etc.etc. Even a recipe for MIRACLE WHIP! I have had this book for 13 years and I love it. I was sad when I heard that Carla had passed away. This is absolutely *the* guide to homesteading. I need sooo much help in some of these areas, but it really looks like the option of us living in the country is not going to happen – like animals and all that goes w/ them. I also won’t be growing a fruit tree, I don’t think. So my question is – is this still a “keeper” book for us? I think the areas I need the most help in are gardening and preserving (canning) but I think I am doing pretty well w/ drying. I think this looks great but I prefer not buying books to just add to my clutter. Thank you! Hmmm…there is so much information in the book that I would lean towards “yes”, even in an urban setting. Each section is self-contained, so if you only need information on XYZ, you just go to the relevant bit. If you find it overwhelming to page through a large volume, let me know which specific topics you’d like to know more about, and I can tell you which books I’ve read on the subject that I like the most. I don’t think there’s much about homesteading that she doesn’t at least touch on in the book. It’s an amazing testimony to her life and experience. Hi – thanks for this recommendation. I have just purchased it online and eagerly waiting for it to arrive. It will be interesting to see how it suits us here in Australia. My husband and I are wannabe homesteaders currently living in a suburban house with our veggies, chickens, rabbits and our hearts are screaming to be free. I am loving reading through your site. Best of luck for 2013 – may this be a good year for everyone. Many homesteading activities are universal, so I think you’ll get your money’s worth. All the best to you and your family in the upcoming year. I’m in Australia (VIC) and considering buying it too – adding it to my list of books to buy next time I get some overtime paid out! I just came across this post about the book, Country Living. You may be interested to know that in the mid 70’s my parents took their family out of the city and moved to a 10-acre farm (i.e. unimproved land). 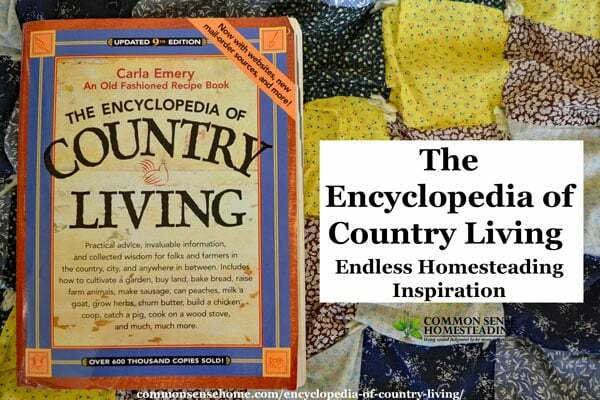 Carla Emery’s book was our homesteading bible. We were city dwellers and didn’t know a thing about homesteading. We learned almost everything we needed to know from her book. Back then, the book consisted of mimeographed pages that were put in a big three-ring binder. This book was seriously instrumental in changing the lives of our family through our homesteading experience. I don’t think we could have done it without the book. I remember reading about Carla’s early editions. Of course, back in the mid 70’s, I was just starting grade school. I’m so glad that Carla took the time to share all her knowledge. It really is an amazing book. Thanks for sharing your family’s story. Do they have a vegetarian version of this? I do not want to catch and kill a pig nor do I have any desire to make sausage! I really do not want to partake in any animal killing! The book is huge, with the majority of content related to a wide variety of subject areas. I’m not aware of a vegan/vegetarian homesteading book, but it would be very easy to skip the sections that are not relevant to you. The book is about 2 inches thick, so there is plenty to choose from. Oh honey, you’re not alone! That seems like the story of my life far too often. Everything takes way longer than it should, and the to do list only gets longer. You just need to eat the elephant one bite at a time. Start with one thing, then tackle the next, and so on. The most important stuff gets done, some things don’t. Something needs to give, and it’s generally either “the list” or your health and/or sanity. As a matter of fact, i think I’m going to schedule some social media stuff and get my tail to bed instead of finishing the post I should be finishing, because it’s late and it’s cold and I’m too tired to think straight. Your absolutely right. I really think i’m going to the store to get one if those BOXed wines with a spout. For days like today! Thank you so much. Momma’s gotta do what momma’s gotta do! I was realllly blessed by this exchange. Thanks for the honesty! And thanks a thousand times for the book recommend! Blessings to you both. And Cheers! Thanks for the heads-up concerning this book, looks great. I especially look forward to reading the grasses & herb sections. It’s a great book, written by someone who actually lived the life they wrote about. I tried to find this book about 30 years ago and I couldn’t find it anywhere, so I wrote to Carla. She sent me a note back that I could buy the book from here, so I sent her the money and she sent me the book, but the book was actually a photocopy, she had photocopied the whole book! With the book she sent me a nice note explaining that was the only way to get the book new at that time. I remember reading that part of the story. I’m glad there’s a publisher willing to keep it in circulation now. I have the mimeographed book, too. My grandmother lived just “down the road apiece” and bought Carla’s book chapter by chapter. This is probably the one (of about 10) books I would save in a fire. As well as being very informative, it’s very well-written, so fun to read. I found the canning information in the earlier edition worth xeroxing as it was pre-modern standards, so dangerous I suppose, but what my mom did… latest edition uses the new standards so probably to be recommended. Sigh. There are charming bits, like the diagram of where to shoot the pig/cow so it dies instantly… and the instruction to run towards it when it drops as fast as possible, but carefully because you’re holding a sharp knife (“don’t run with scissors” I heat my mother say) for the exsanguination. Oh yes, quite a thorough book considering the breadth of topics. I love this book.